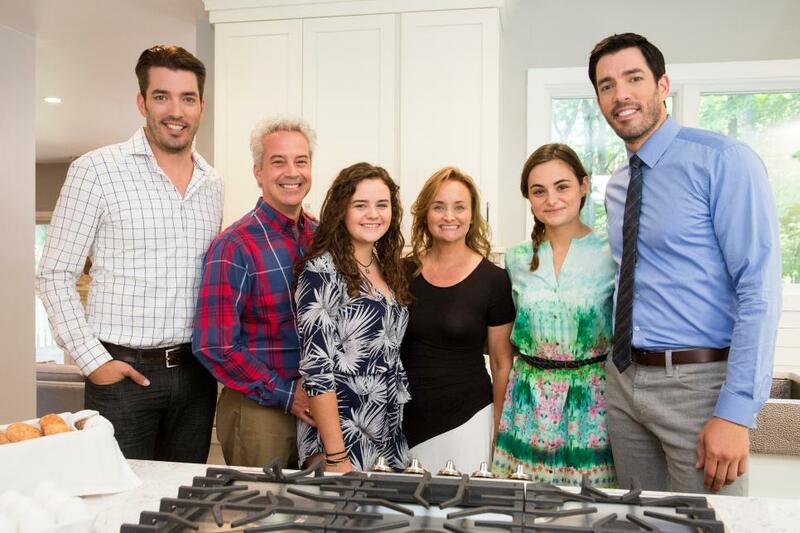 Suzanne and Kevin Vining's new home in Pound Ridge, New York, was the perfect place for the couple and their two teenage daughters. 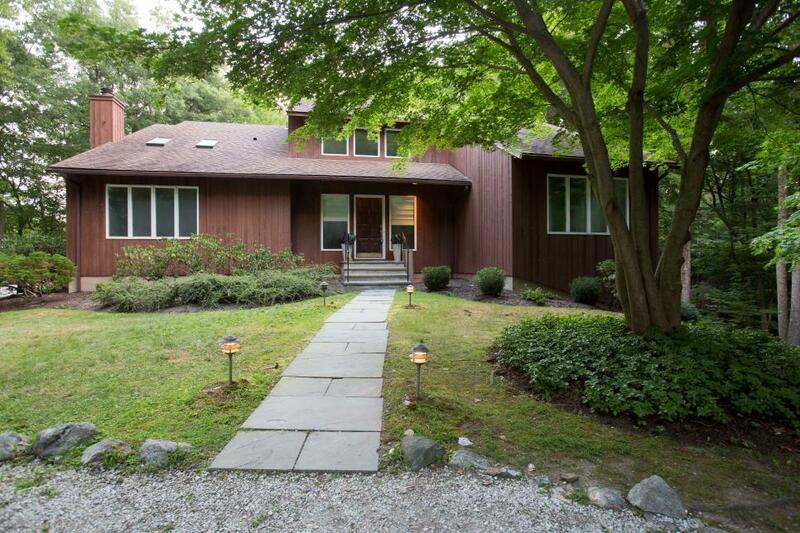 However, this split-level home in the woods was in major need of a total remodel. 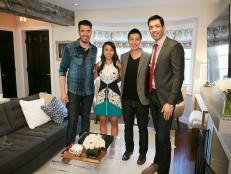 See how the Property Brothers transformed the property into a cozy, modern home filled with bohemian touches. 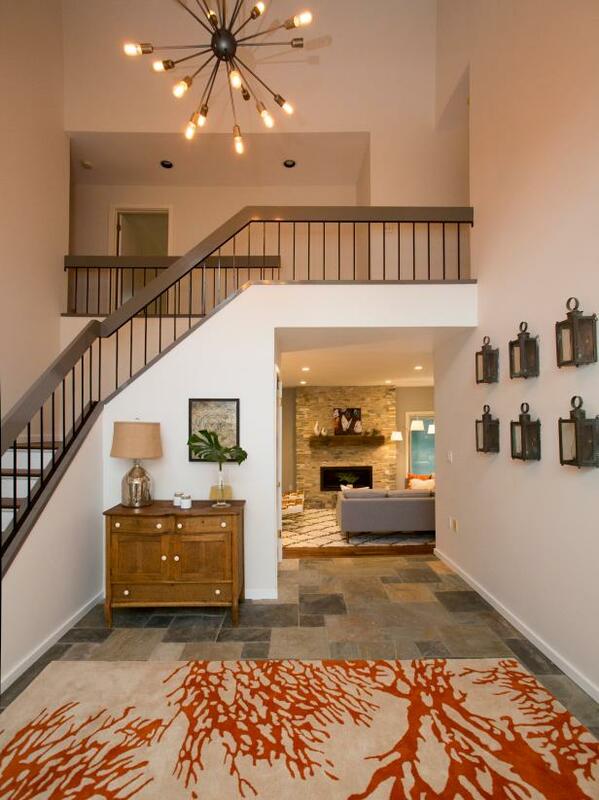 The first stop on this renovation was, fittingly, the entryway. To give the first room in the Vining’s house a welcoming and cheery vibe, the Scott brothers punctuated the space with vintage furniture, industrial accessories and a bright patterned rug covering the slate-tiled floor. 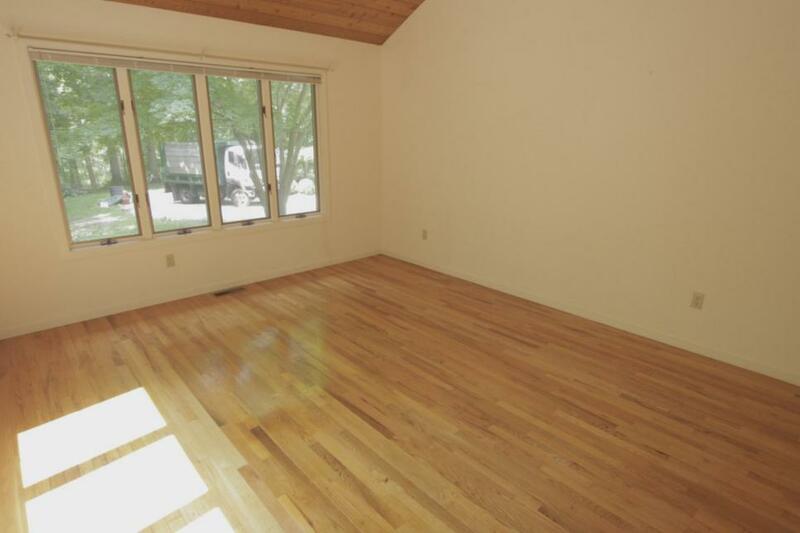 Flooded with natural light from all sides, the Vining’s living room certainly had plenty of potential. 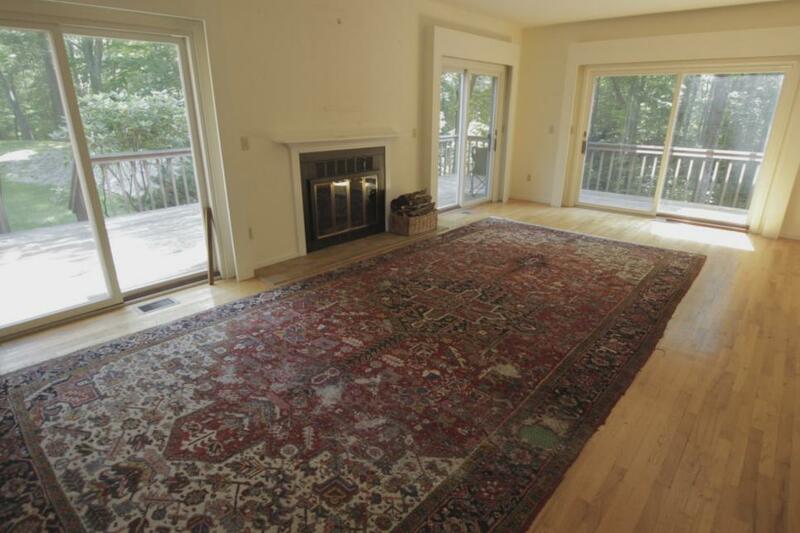 But the outdated fireplace and antique rug made the space feel dreary. 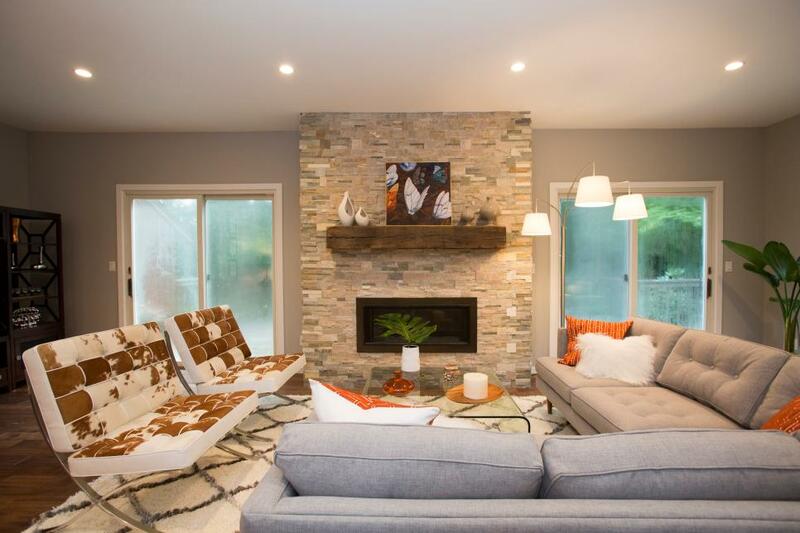 After the Scott brothers took over, they transformed the dated area into a modern-meets-industrial living room fit for a 21st-century family. They maintained an open and airy feel with light-hued furniture and a bright white rug atop the hand-scraped hardwood floors. 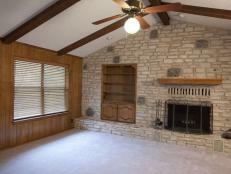 The Vinings were happy to find a home with a pre-existing fireplace. 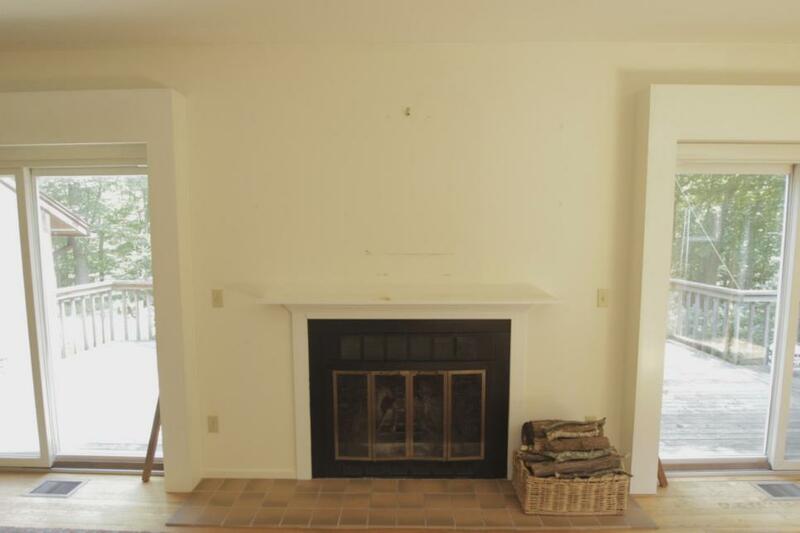 However, this dated hearth was anything but warm and charming. 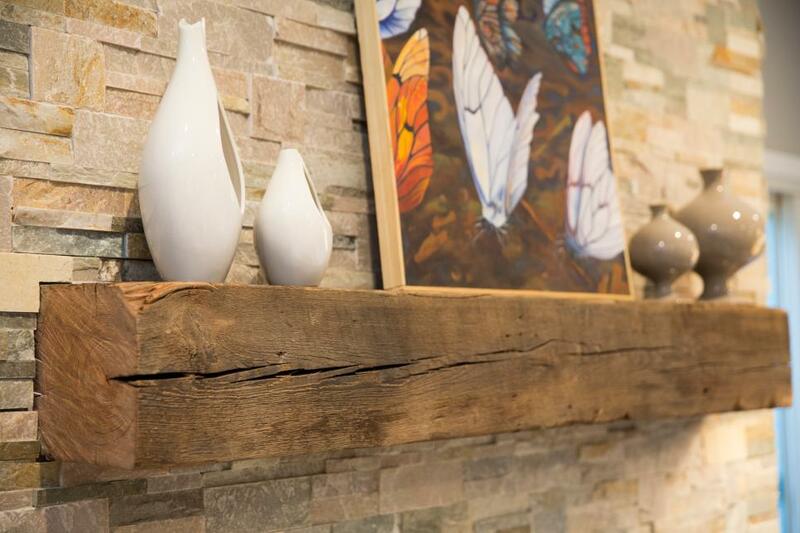 Drew and Jonathon built out the fireplace, creating a gorgeous feature wall, equipped with a rustic mantel and tasteful accessories. 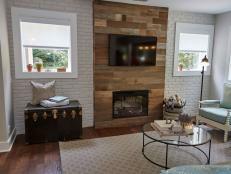 To create a hearth that was both industrial and warm, the Scott brothers installed a raw wood mantle above the fireplace. 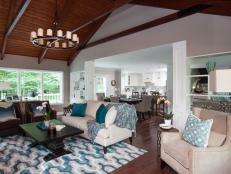 They accented the rustic feature with a colorful painting and elegant pottery. 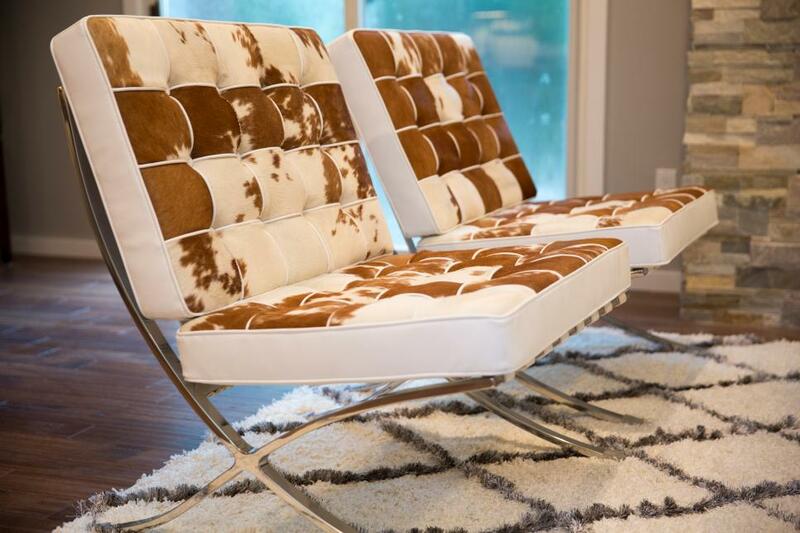 These faux cowhide chairs give the room a funky touch, while still maintaining a modern feel, thanks to their stainless steel backing. 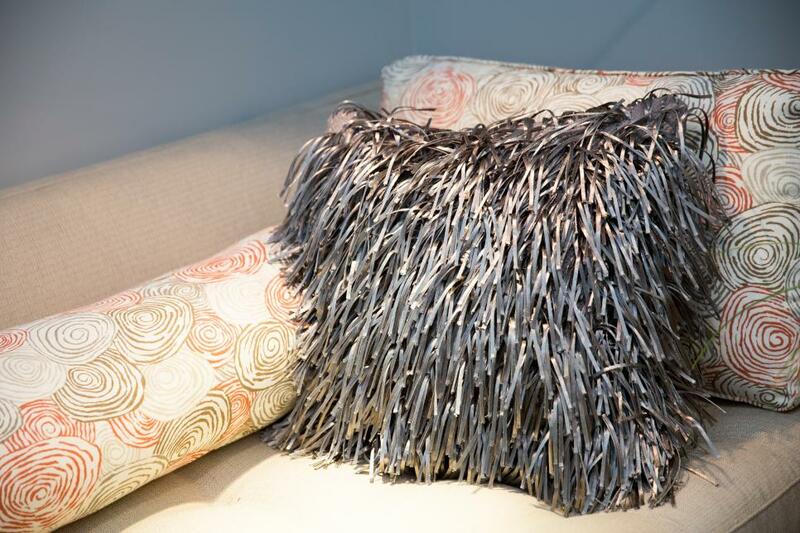 Silver shag and colorful curlicue pillows yet again play up the fun and funky vibe Drew and Jonathan created for the Vining’s living room. 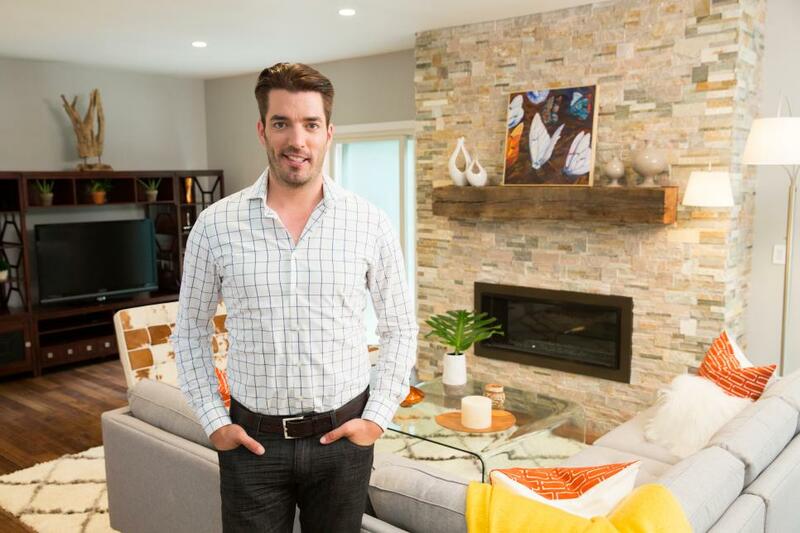 Jonathan proudly poses in front of his latest masterpiece: an inviting living room styled with industrial elements and bright accents. 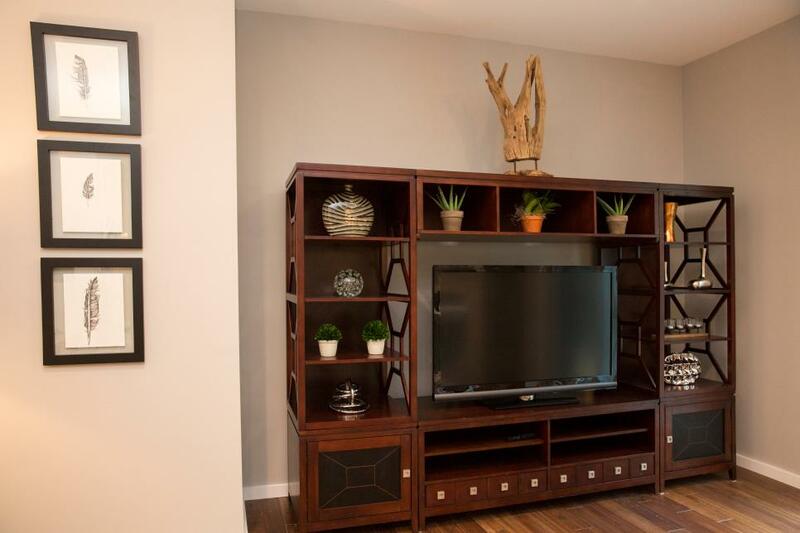 What modern living room would be complete without a bit of entertainment? 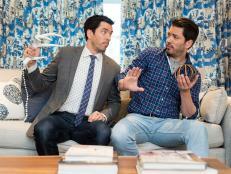 The Scott brothers housed the family’s flat screen TV in a dark-wood TV cabinet, scattered with an eclectic mix of accessories and plants. 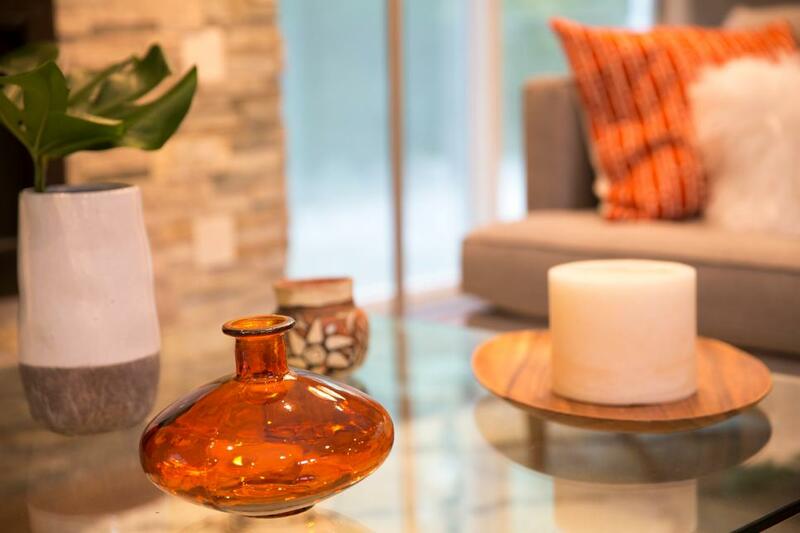 While the Scott brothers mostly stuck with neutral hues in this living room, they punched up the room with a few bright pops of orange. 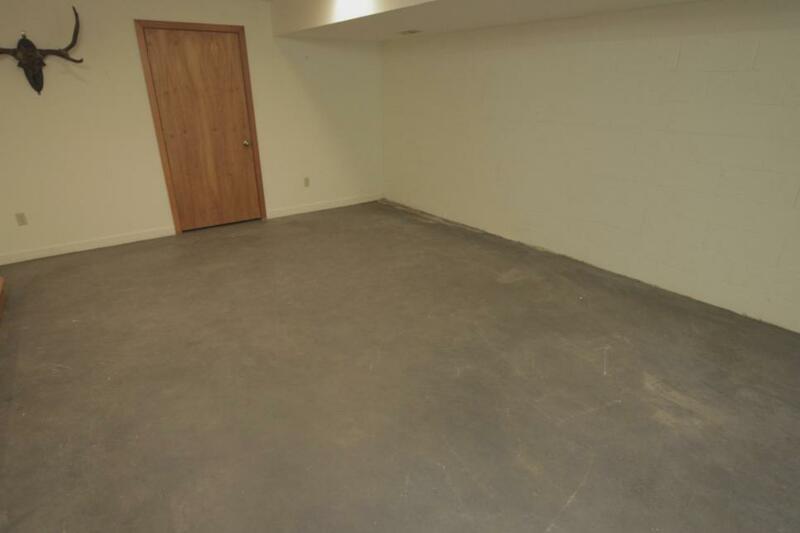 Just down the stairs, the next stop on this home reno: the basement. 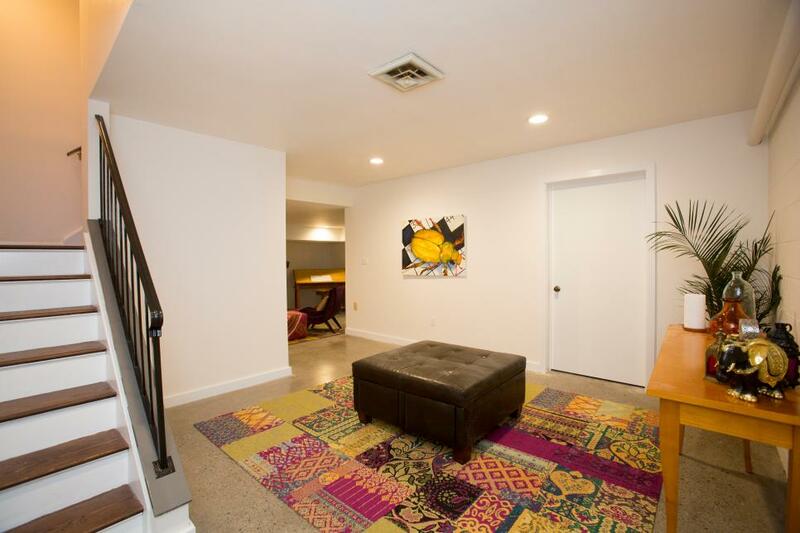 Thanks to the colorful quilted rug, there’s an immediately vibrant vibe in the underground space. 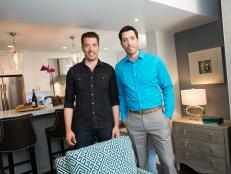 Before the Jonathan and Scott took over, the only design element in this basement was a pair of wall-mounted antlers. 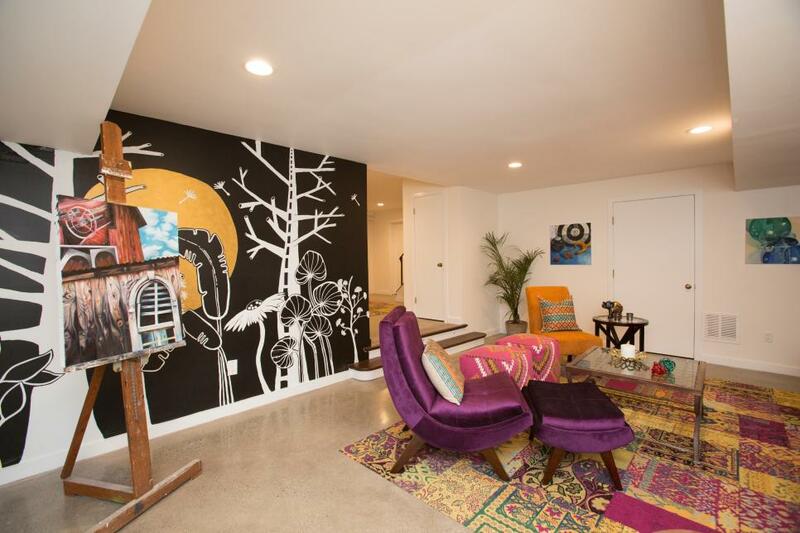 After adding a bold mural, vibrant furniture, and plenty of spaces to create — the basement was totally revamped into an inspiration space where the Vining daughters can be inspired to create art or even just lounge. 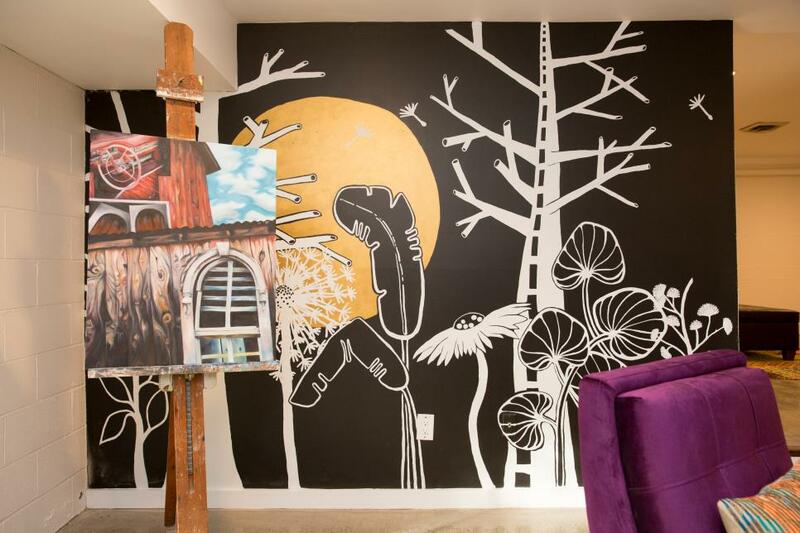 A rustic easel plus a mural for inspiration: What more could someone ask for in an art studio? 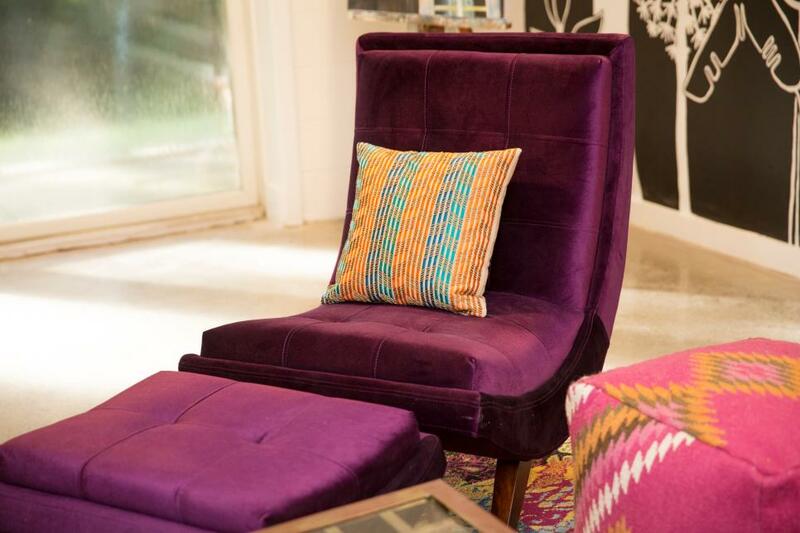 A mix of vibrant colored furniture and accessories — like this purple velvet chair topped with an orange and teal throw pillow — make for a perfectly Bohemian-chic room. 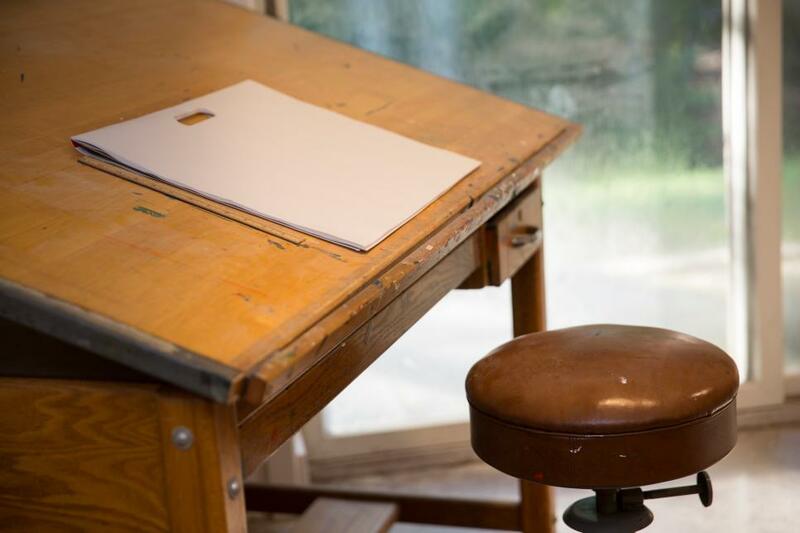 In case an easel wasn’t enough space to create, the Scott brothers also placed a vintage drafting table in the room where the Vining daughters can draw or paint. 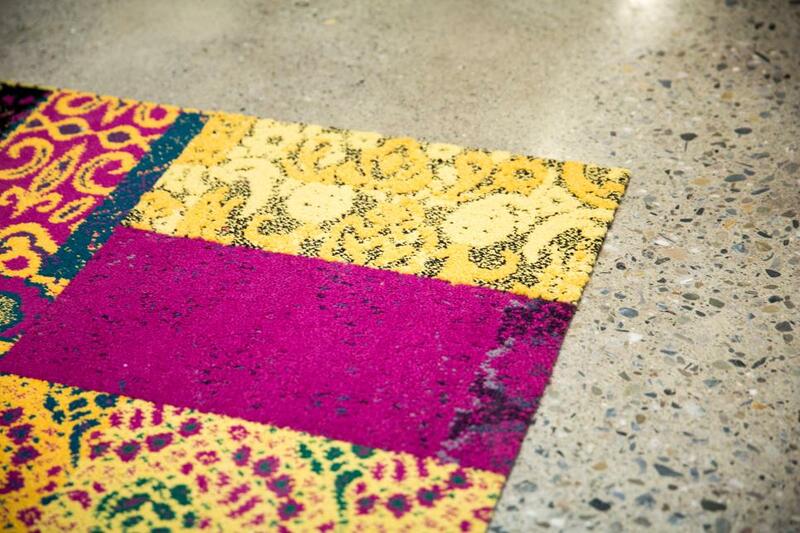 This wacky quilted rug add the perfect touch of Bohemian cool (and warmth) to the industrial, sealed-concrete floors. While the Vining’s dining room boasted ample light and an unique wood-paneled ceiling, the space lacked any kind of pizzazz. 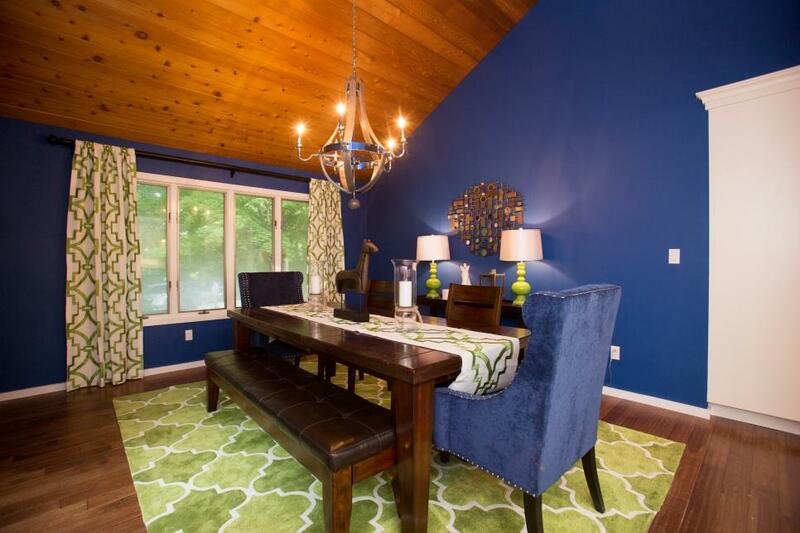 Thanks to a fresh coat of deep blue paint, the room became a bold yet elegant dining area. 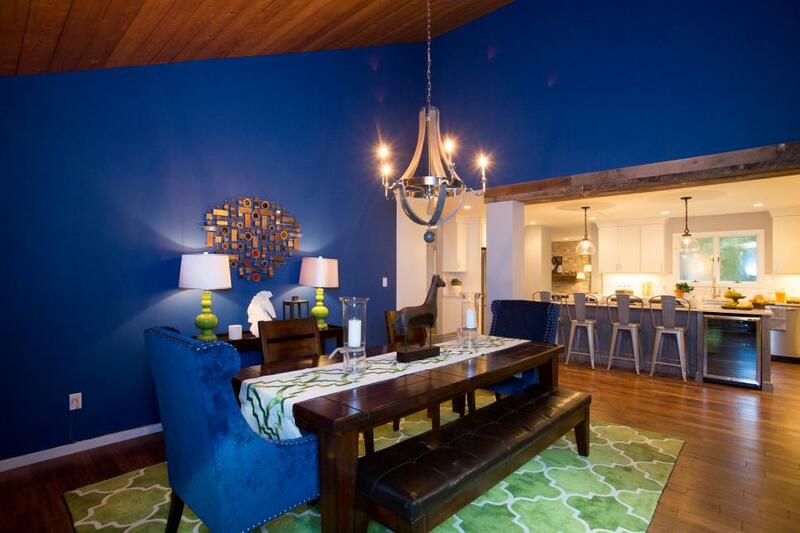 The dramatic hue helps highlight each of the warm wood elements in the room, including the exposed ceiling, hardwood floors, and large dining table. 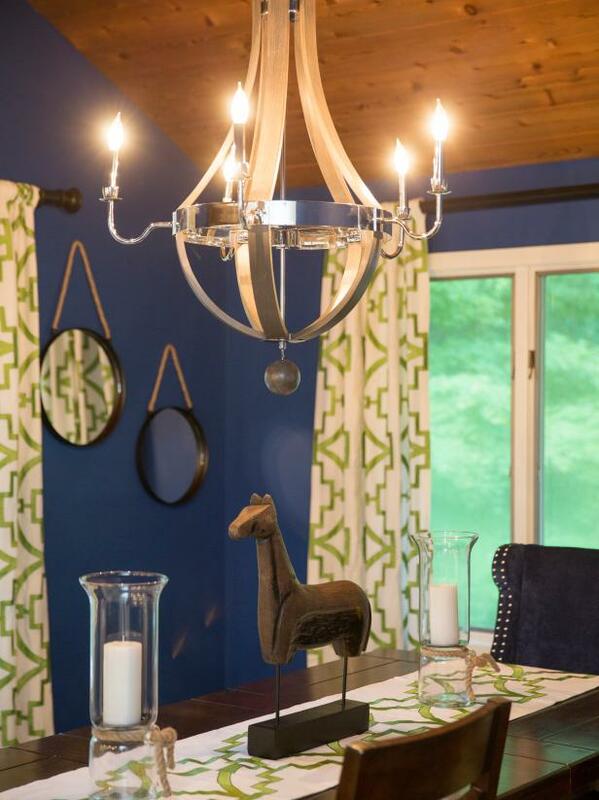 The blend of bohemian and modern continues in the dining room: The funky metal chandelier strategically balances the sleek, dark dining table. 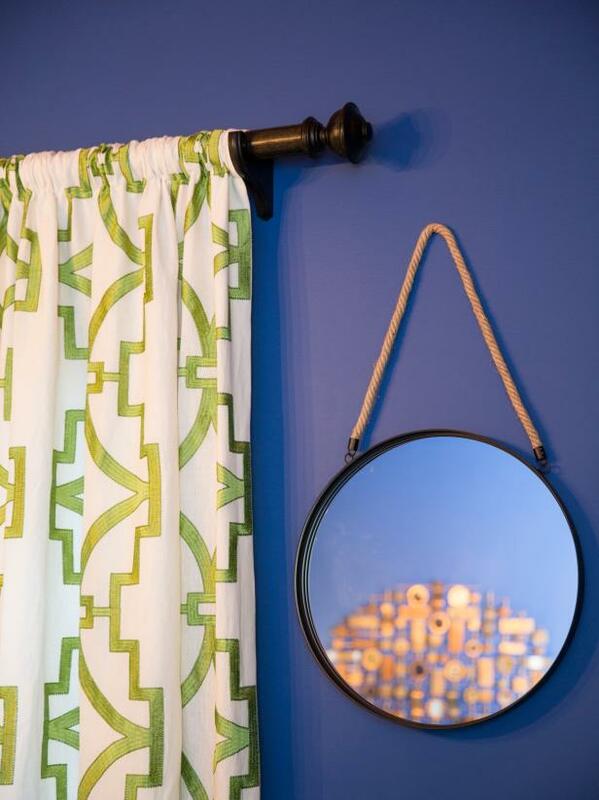 Industrial hanging mirrors add just a touch of sparkle to the room, and help visually break up the dark blue walls. 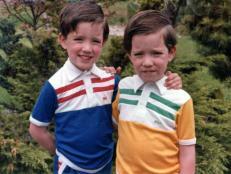 The Scott brothers also contrasted the dramatic blue walls with plenty of olive green and white accessories. 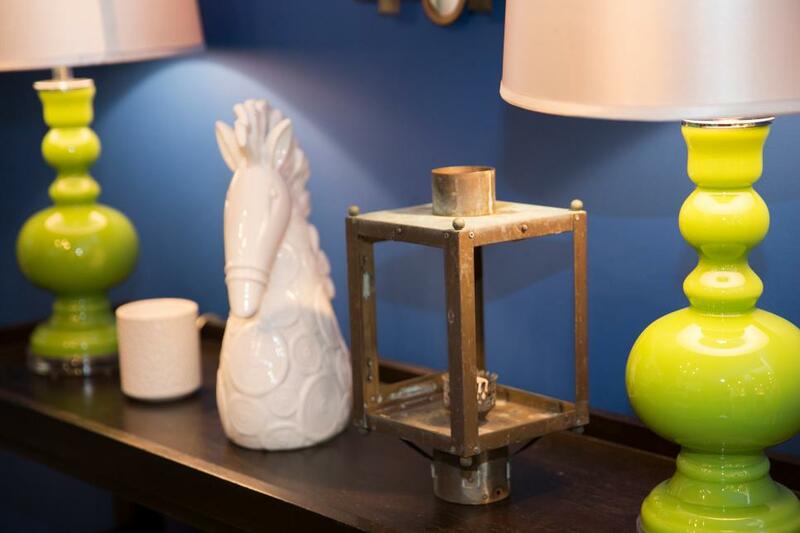 From rugs to curtains to white ceramic horses, this room maintains a bright, welcoming feel, despite the dominant wall color. Rather than stick with a conventional dining set-up, Jonathan and Drew opted for a large wood table with an eclectic mix of chairs and a bench for seating. 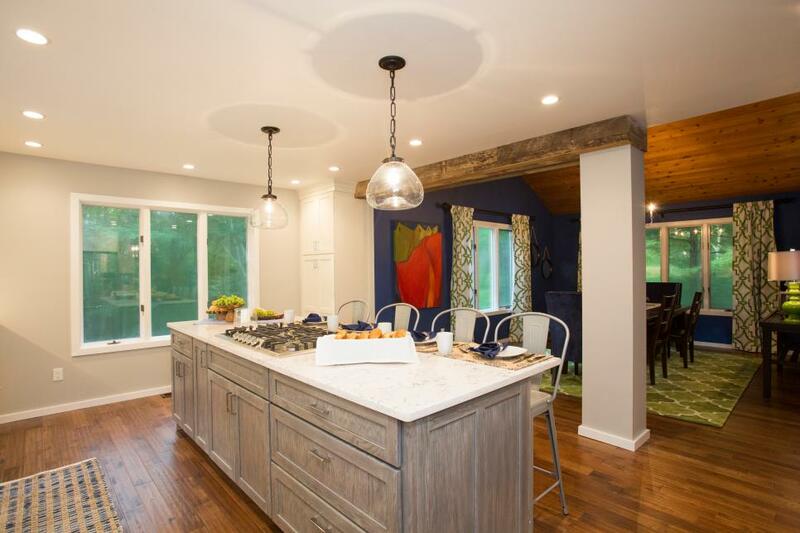 The dining room seamlessly flows to the kitchen, thanks to the modern, open layout the Scott brothers created for the space. 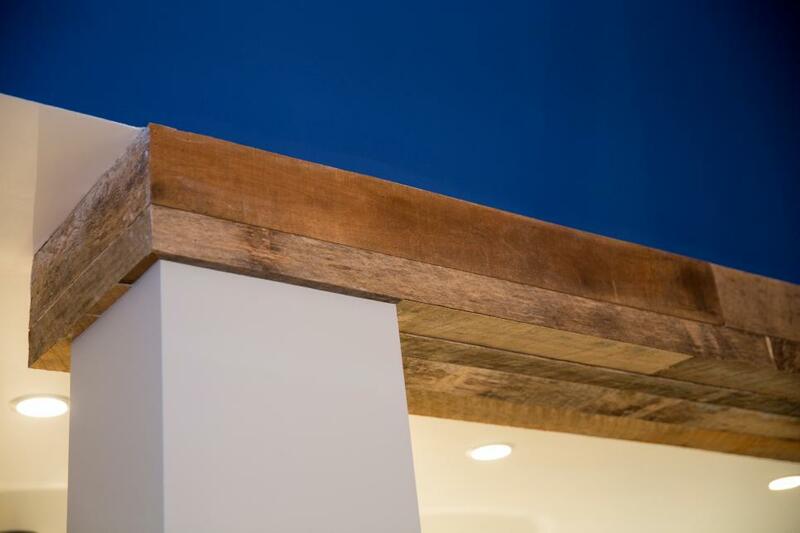 But in order to keep the rooms separate, they installed a raw-wood beam that doubles as a cool design detail. 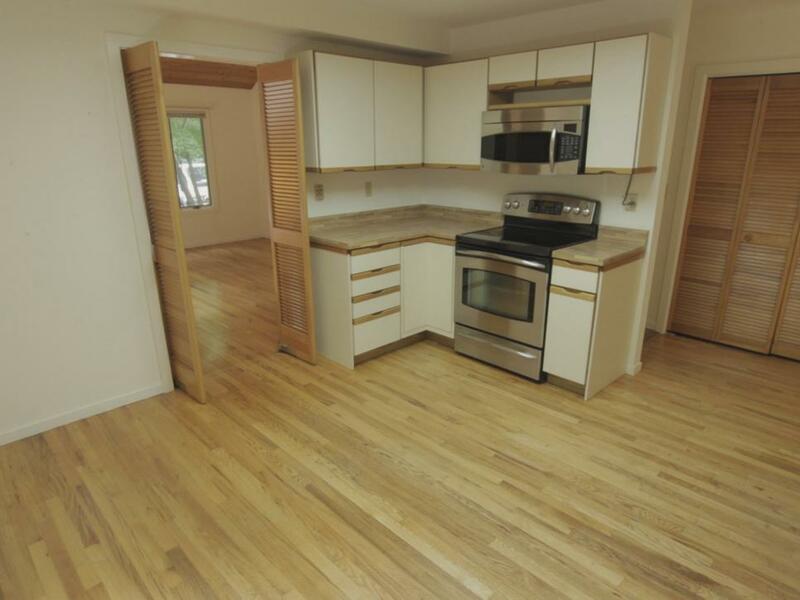 Before, the Vining’s kitchen was cramped, closed off, and filled with outdated shelves and appliances. 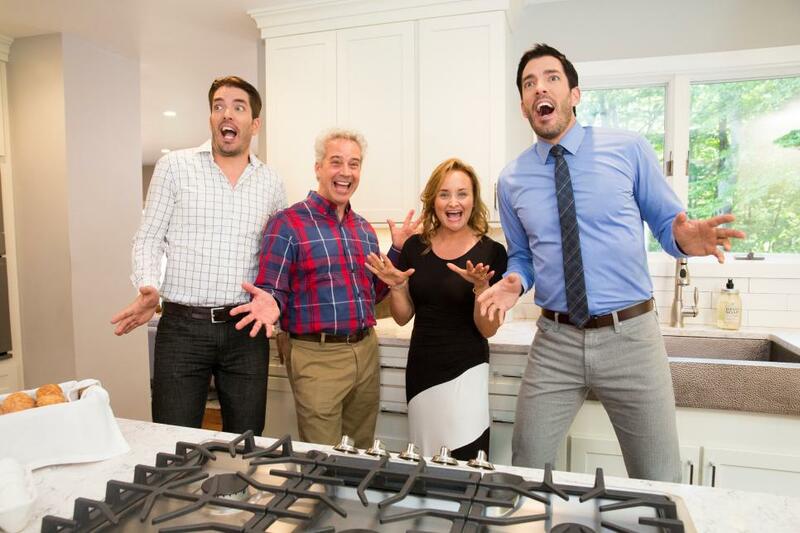 By knocking out the wall between the kitchen and dining room, updating the appliances and adding plenty of storage solutions, the Scott brothers created a fresh and functional culinary sanctuary. 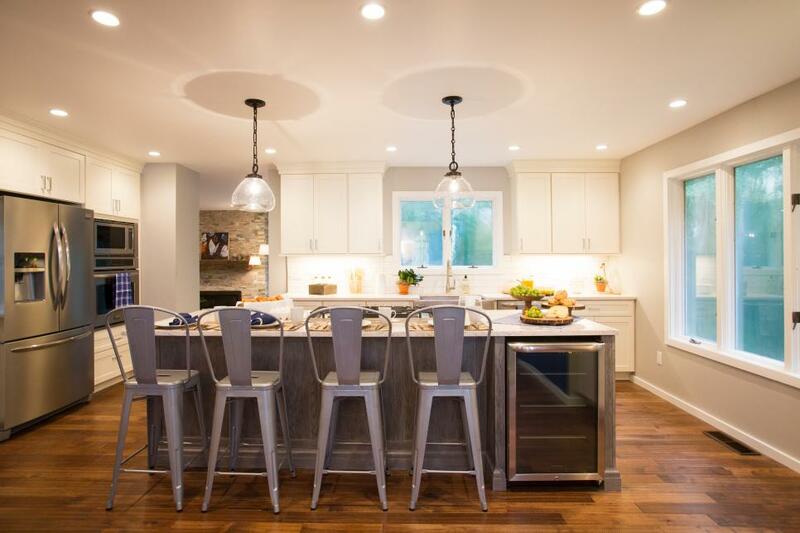 To make the kitchen as elegant as it is modern, the Scott brothers installed gleaming white quartz countertops, which help keep the space feeling open and airy. 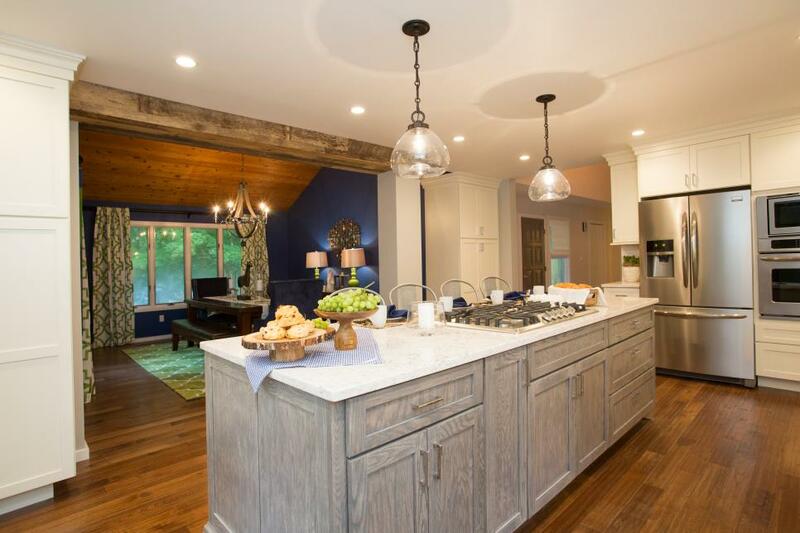 The old kitchen was certainly lacking storage, but this reno offers a multi-functional island and plenty of cabinetry. Keeping with the modern and industrial feel carried throughout the home, Jonathan and Drew included both white and reclaimed wood cabinets in the space. 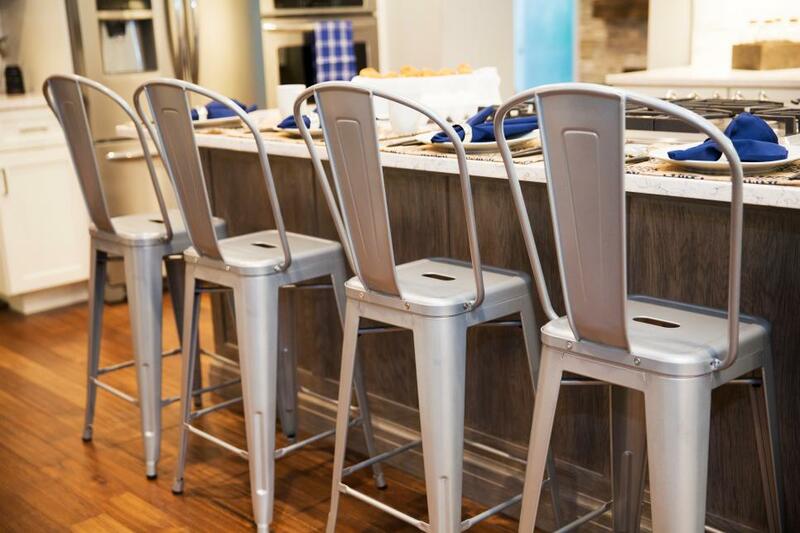 This versatile kitchen island not only adds additional counter space, but also a cool breakfast bar, equipped with industrial metal chairs. 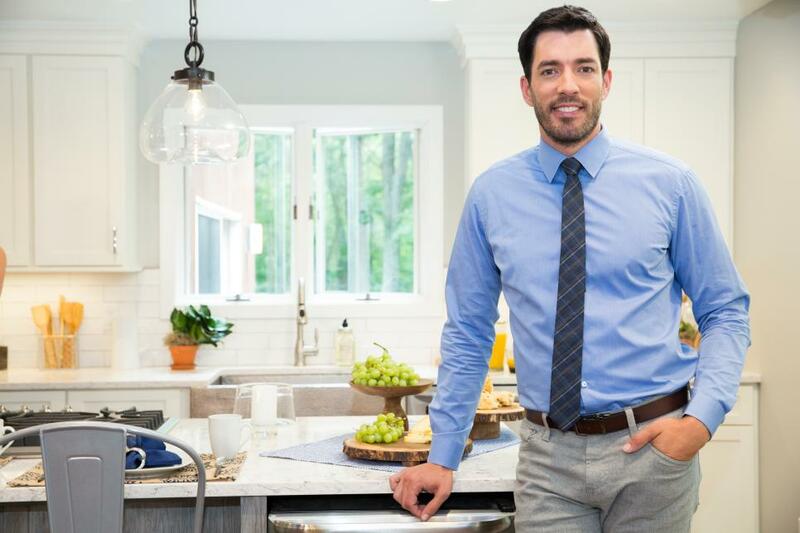 Drew smiles for the camera while leaning against the elegant quartz countertop, proud of the impressive way he brought life back into this kitchen. Even the place settings are impeccably styled! 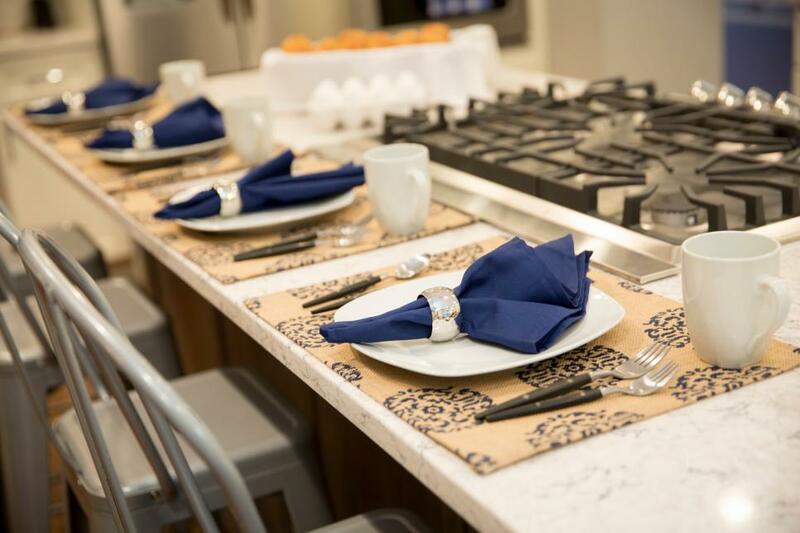 The napkins and placemats on the island subtly bring the combo of deep blue and white from the living room to the kitchen. 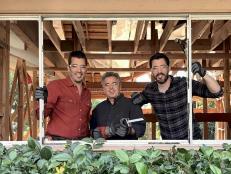 The Vining family's old appliances were in dire need of upgrades. 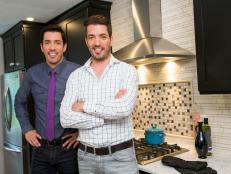 Luckily, Jonathan and Drew swapped their dated fridge, oven and microwave with new stainless steel replacements. 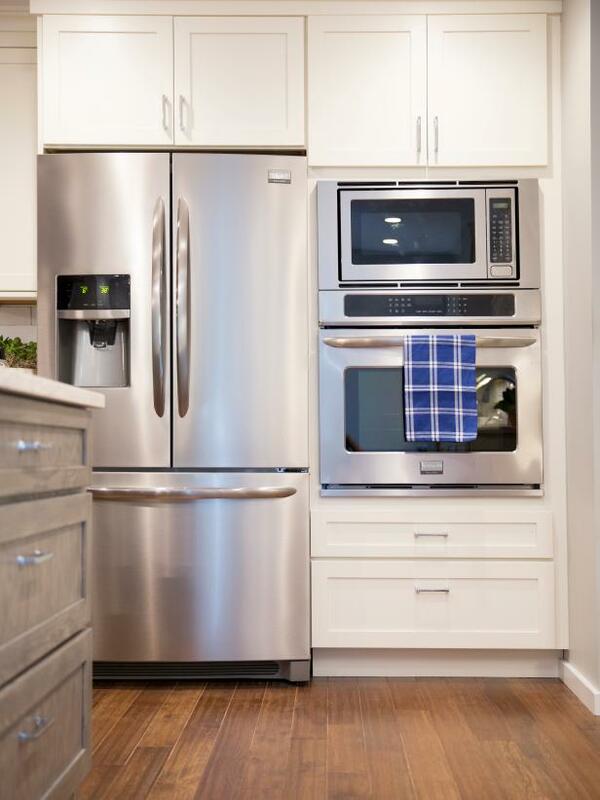 The shiny silver is nicely balanced by crisp white cabinets. 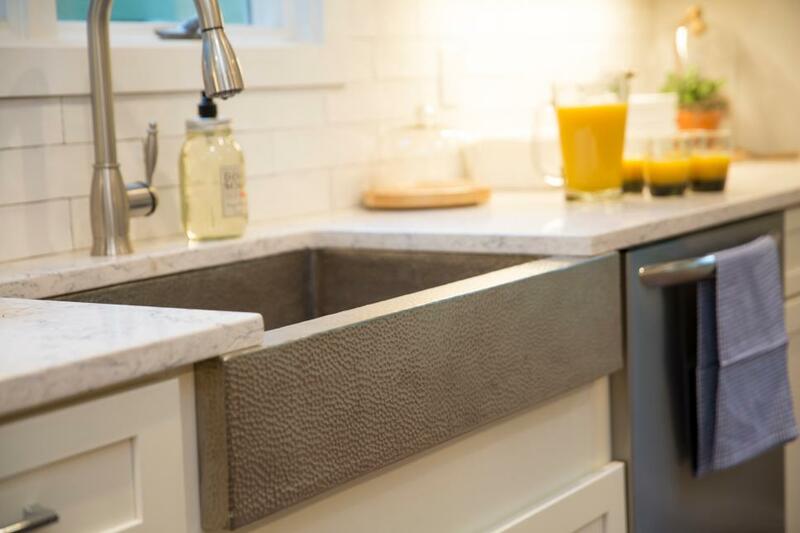 This gorgeous custom-hammered, farmhouse sink rests beautifully in front of the kitchen’s crisp white subway tile backsplash. Really, what modern home would be complete without a built-in wine refrigerator? 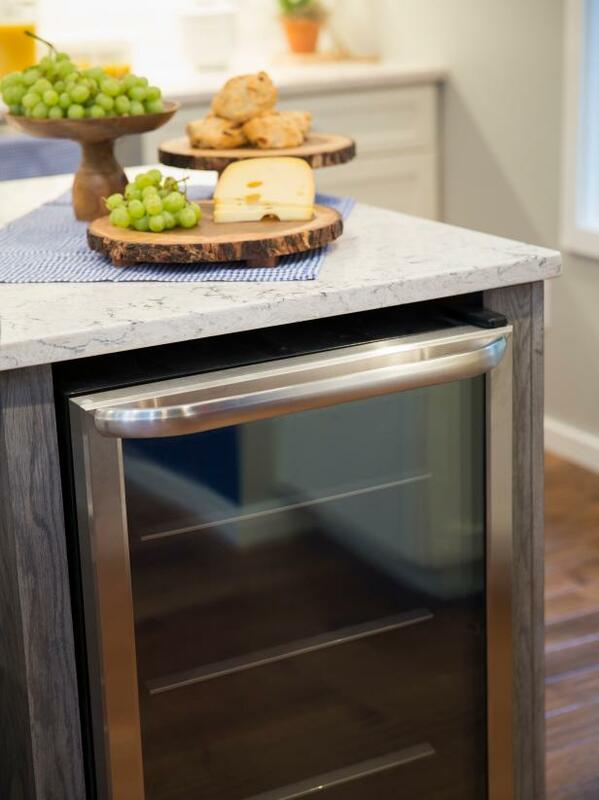 This one fits seamlessly beneath the kitchen island, meeting the all Vining family's vino needs. Surprise! 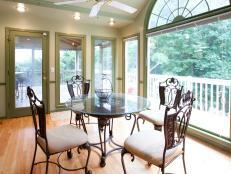 The renovation is (beautifully) done. 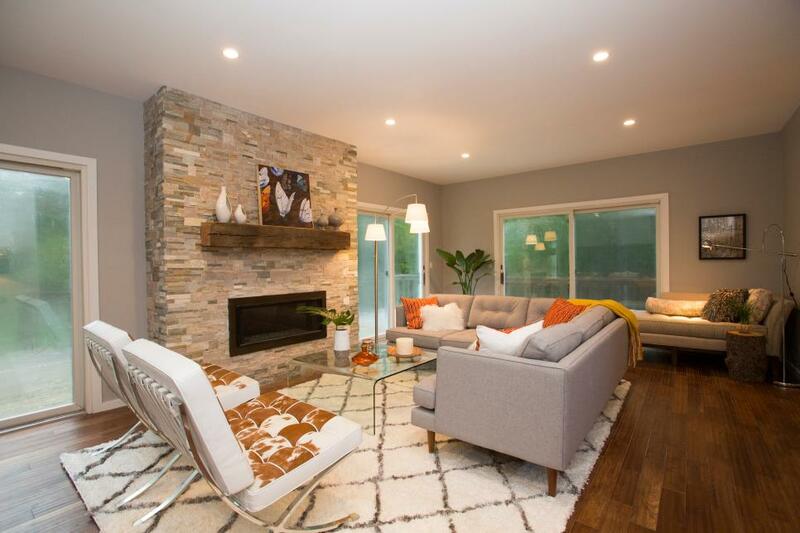 The final product: A fully renovated home that blends industrial and modern aesthetics, perfect for Kevin, Suzanne, and their two lovely daughters.